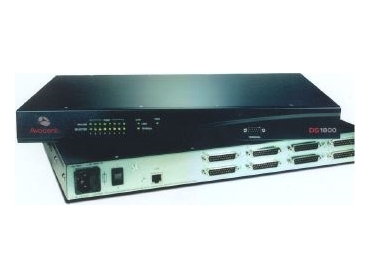 The Avocent DS1800 KVM switching system. DOCUMENT management specialist TAB Datafile is introducing the latest Avocent DS1800 KVM switching system, which can minimise the number of screens needed for LAN systems while simplifying access to information. The DS1800 - which complements the space-saving capabilities of TAB Datafile's moduLAN technical furniture system - enables users to access multiple data centre devices from a single screen through Avocent's DS View application. The eight-channel, rack-optimised network appliance delivers, through IP connections, centralised access and control to multi-platform servers including PS2, Sun, UNIX/Linux and USB types. * Unblocked access to servers. * Access to an unlimited number of servers (the DS1800features KVM OVER IP connectivity and works with users' existing network architecture). * Access to virtually any number of users, who can access servers from any IP connection. * Time-saving flexible and scalable design. The DS1800's Ethernet technology simplifies expansion and configuration. * 10/100 Ethernet connection for digital KVM client software; analog KVM connections to serves; 10/100 Ethernet connection for single-sheath CPU cables including PS/2, USB and SUN. The Avocent switching systems can extend the benefits of TAB Datafile's moduLAN system by enabling companies to dispense with the need to install thousands of dollars worth of multiple screens and instead concentrate their resources into a single high quality installation. TAB Datafile Australia is part of the international TAB Corporation, which is one of the world's largest document management specialists, offering products which facilitate the convergence of electronic and hard copy document management system.